Art and travel go together like red wine and chocolate. But if your schedule doesn’t leave time for the latest gallery opening, why not take in some of the works en route at the airport. Airport art galleries are popping up across the country and they have some pretty impressive works. Here are five you don’t want to miss. When it comes to airport art galleries, Minneapolis-St. Paul isn’t usually at the top of the list. But the airport recently added its first major art installation in 15 years. Artist Philip Noyed created three separate works for the collection, designed to welcome visitors to the city. L’Etoile du Nord (Star of the North) is the Minnesota state motto. It is also the name of Noyed’s first installation. Noyad’s L’Etoile du Nord is 6 feet tall, made of aluminum and covered with holographic rainbow vinyl. Inside the star is a crystal prism, so tiny light rainbows show on the ground below the star. 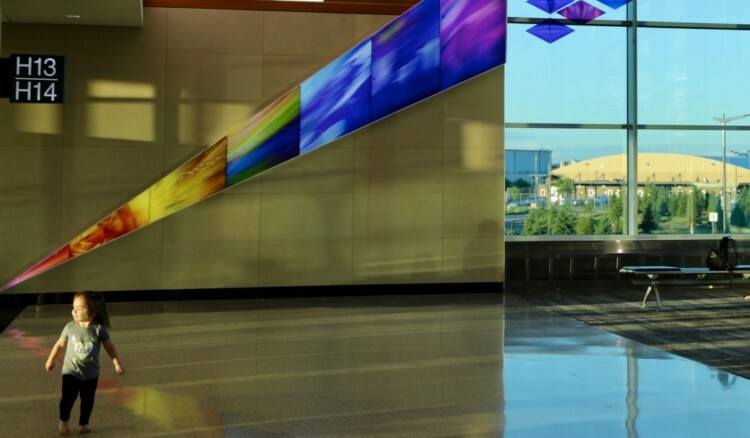 The second installation, Aurora Borealis, brings the colors of the Northern Lights to life in the airport. The Aurora Borealis wall is 60 feet long by 6 feet tall. In the very middle is a rainbow diamond made of clear acrylic rods and lit with LED color lights that go through the colors of the rainbow. The third display is titled Leap of Joy, and is inspired by Henri Matisse and the Fauves’ painting, Bonheur de Vivre (The Joy of Life). The display includes a 3D printed leaper covered in holographic rainbow vinyl covering. The image includes floating diamonds curving in the way an airplane turns. The rainbow motif in all three installations is not only beautiful, but also symbolic, conveying that no matter race, creed, nationality or sexual orientation, everyone is welcome in Minnesota. The Minneapolis-St. Paul airport isn’t the only airport art gallery of note. Here are four more airport art galleries that warrant a little extra time between flights. Atlanta’s High Museum of Art should definitely be on your to-do list when in Atlanta. 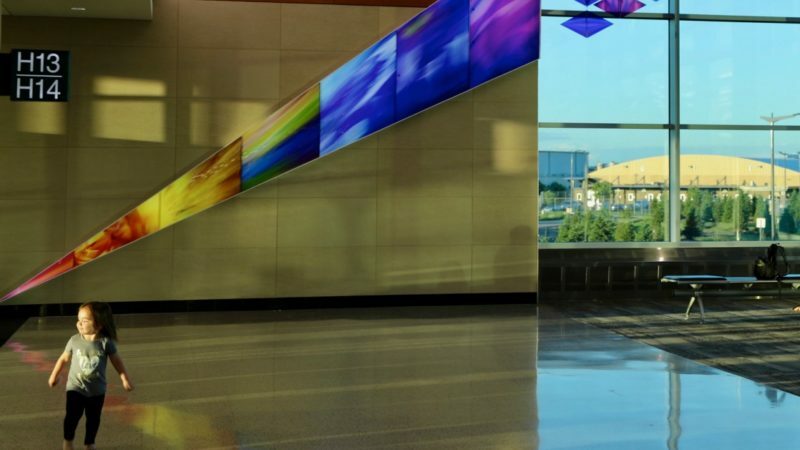 But if you don’t have time to make it to Midtown, the latest art installation at Atlanta’s Hartsfield International Airport is not only a work of art, but very calming too. The piece, called Flight Paths, makes the viewer feel like he is walking in the forest, complete with chirping birds and rain showers. 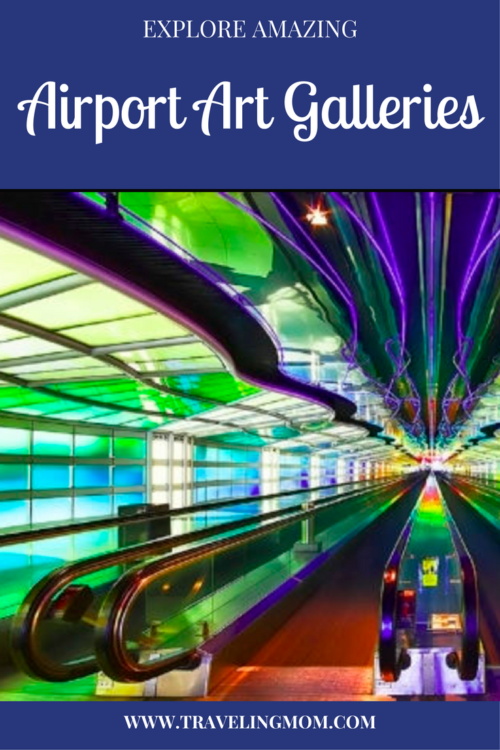 It’s big too – 450-feet long – filling the underground walkway between Concourse A and B.
It’s the perfect escape when the flight to your Florida beach condo is delayed and the kids are antsy. Interesting tidbit – artist Steve Waldeck first conceived the piece 13 years before installation. In addition to Flight Path, Atlanta’s Hartsfield Jackson Airport has quite an art collection. There are 10 permanent exhibits and three rotating exhibits. One of my favorites is the rotating work of young artists in Georgia’s K-12 schools. You can really see the young talent in some of these pieces. Denver Airport was named one of the best airports for art by USA Today readers in 2013. I can see why. There are pieces on display everywhere. Find the wild-eyed, 32-foot tall stallion sculpture titled Mustang on the way into the airport. On the way back from skiing at Keystone Resort, we know we’ve arrived when we see his piercing red eyes. It’s actually a little freaky. As with many of the airports, Miami International Airport art galleries are part of the county’s art in public places program. The latest airport art exhibit opened at MIA’s Central Terminal in August of 2017. The exhibit focuses on textile art. Each work is the same size, but other than that, artists are free to experiment. The result is a beautiful variety of works. Artwork at Chicago’s O’Hare airport includes paintings, sculptures, murals and exhibits. The coolest is a 745-foot long kinetic light sculpture travelers can ride through along the moving sidewalks in the tunnel connecting Concourse B and C in Terminal 1. The sculpture, titled The Sky’s the Limit is by Michael Hayden and includes 466 neon tubes, 23,600 square feet of mirrors reflecting over one mile of neon. In addition to outdoor landscapes, there are pieces inside Jeppesen Terminal, on airport concourses, in the train tunnels, and even on the trains themselves. 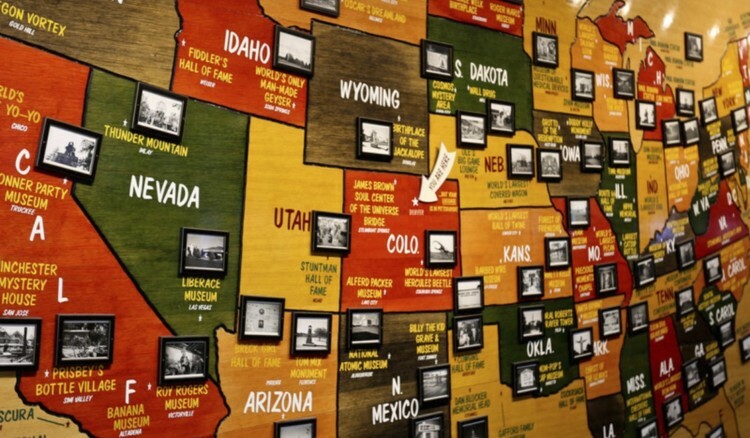 One of our favorite pieces is a map titled America, Why I Love Her by Gary Sweeney. 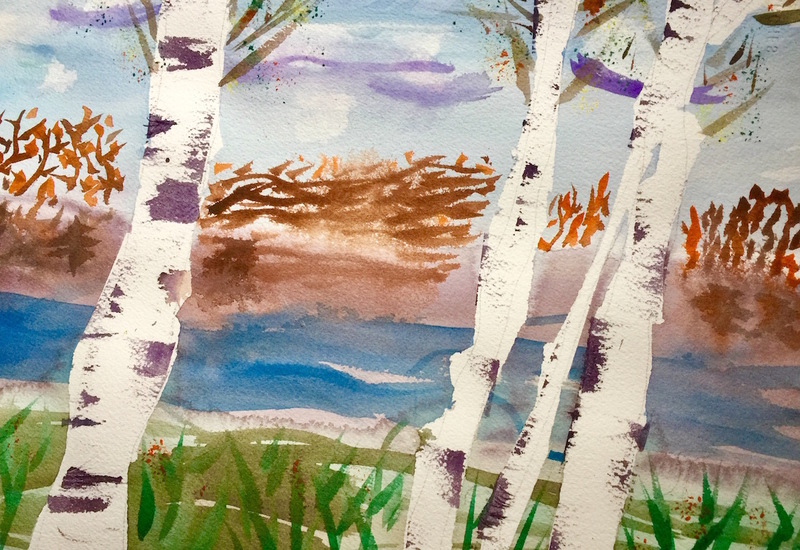 This painting is part of the permanent collection. In addition to finding various places on the colorful map of the United States, we like to see the kitzy roadside attractions the artist has interspersed using old photographs – I bet you’ll find at least a few you recognize. The Philadelphia airport art program began in 1998. There are 20 current exhibits. Kids will enjoy The Gum Spotting Experience by Philadelphia artist Michel Delgado. The piece examines discarded gum in all its shapes and sizes. Look for it on Terminal F.
For non-ticketed passengers looking to pass some time, there is a pop-up movie theatre that shows documentary shorts about the City of Brotherly Love. Bryn Mawr Institute developed the theater, located at the Terminal B-C baggage claim. Disney's Art of Animation Little Mermaid Rooms... Top Value Resort Pick!